Photography has always been a relatively mobile art form—even a view camera on a tripod is less burdensome than the tools of the painter or sculptor. Now, new technologies are giving photographers more freedom with capabilities like wireless camera control and mobile Internet connectivity. Here are a few examples of wireless tech that are helping to shape the future of the medium. One of our favorite remote-control systems, the Hähnel Giga T Pro II has an impressive 300-foot range for triggering your camera shutter, and it’s great for avoiding camera shake with long exposures. It also features a fully adjustable intervalometer for time-lapse photography, allowing you to set both the number of exposures to take and the delay between them. Available for Canon, Nikon, Olympus, Panasonic and Sony cameras. List price: $129. If you have a compatible camera (over 280 camera models are supported) and an iOS or Android smartphone, Triggertrap Mobile gives you multiple ways to fire your camera remotely, like a Sound Sensor mode and a Motion Detection mode. The app-based system also offers variable-interval time-lapse recording, basic cable release and bulb settings, and a unique DistanceLapse feature that uses your smartphone’s GPS tracking to release the shutter every time you move a specified distance. List price: From $29 (depending on camera model). 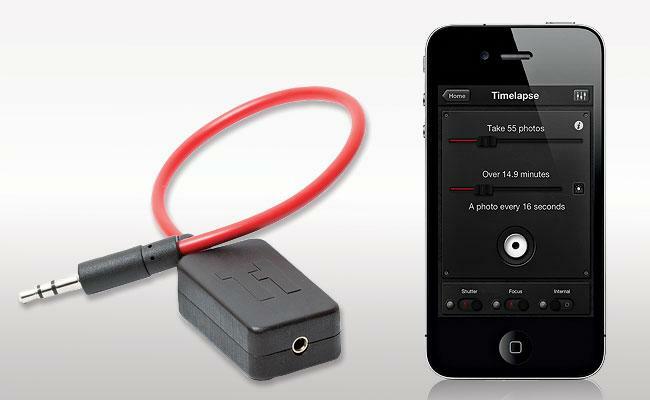 For Canon and Nikon DSLR users, this system gives you a lot of control over your camera via your iPad or iPhone. You can view live images from the camera right on your device, adjust focus with a tap, change multiple camera settings like aperture, shutter speed and ISO, then capture and review your photos. For HD-motion capture, CamRanger even offers touch focus during movie recording. There’s an intervalometer feature, too. List price: $299. Many newer compact cameras, and even some interchangeable-lens models like Sony’s NEX-6, have WiFi built in. This lets the NEX-6 do a lot of cool tricks, like upload photos directly from the camera to Facebook or online storage, save images directly to your computer, shop for new apps for the camera that add new features and capabilities, and even control the camera remotely with your smartphone. Estimated street price: $899 (with 16-50mm lens).